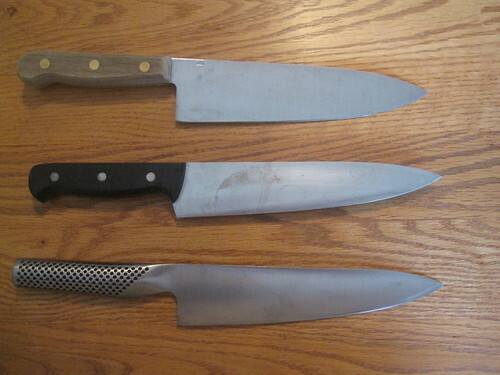 I’ll start this post out by showing you three chef’s knives from my kitchen. The top chef’s knife is a loose one that I picked up for $0.50 or so at a yard sale more than a decade ago – I’m unsure even what type it is. It’s serviceable, but it loses its edge fairly quickly. The middle knife is from a Henckels kitchen knife set given to my wife and I as a wedding gift. It works extremely well for most cutting applications and holds its edge for quite a long time without honing. A similar knife retails on Amazon for $47.99. The bottom knife is a Global chef’s knife, which I received as a Christmas present in 2008. It’s the sharpest knife (post-sharpening), holds an edge almost as long as the Henckels knife, and fits the best in my hand. It’s the best knife I own. It lists on Amazon for $115, currently. If the Global knife is the best knife and I gave it a score of 100, what kind of score would I give the other ones? I’d give the Henckels a score somewhere around a 92 and I’d give the old knife a score of around 70, with 0 being the worst cutting experience I’ve ever had in the kitchen with a knife. Now, here’s the big question: if I can get that 70 knife for $0.50, is that 100 knife really worth $115? In other words, if you have something perfectly serviceable for a very low price, is it ever worthwhile to spend significantly more to get a top quality, highly reliable version of the item? In the scenario above, I would go for the $0.50 knife every single time if I didn’t have a chef’s knife and needed one. That’s because the worst case scenario is that you’re out fifty cents. That’s the worst possible thing that can happen. On the flip side, the best case scenario is that you have a knife that meets your needs for many years to come. Given that the best case is very, very good and the worst case isn’t much of an issue, that would be the knife of my choosing. Free (or nearly free) means that the worst case scenario for an item you need is not bad at all. Claims on the packaging or by the salesperson don’t count! Again, you have to take a look at the worst case scenario for each item. The worst case scenario for the high cost item is far worse than the worst case scenario for the low cost item, but they have similar best case scenarios. If you do not know specifics about the item, stick with the scenarios. The more knowledge you have of the items at hand and their usage, the better buying decisions you can make. Don’t just buy a tire and forget about it. Note what tires you’ve purchased and compare how they grip and hold air compared to other tires. Know what suits your needs and understand fully the terminology used when describing a particular item. Whenever you spend money, you’re spending the fruits of your labor. The more you know about a purchase, the more effectively you can use your money. It’s always key to remember that the money you have is directly connected to the work you do. If you work at a minimum wage job, every $7 you spend (roughly) equates to an hour of your work. If you can save $50 by researching a purchase for 2 hours, that is very much worth your while. If that same research leads you to buying a much better item at a similar price or a vastly superior one by paying a bit more, then that research time was still well worth it. If you don’t have enough money to afford the high end version, then don’t buy the high end version. Buy the basic item that you actually need. Don’t use credit to facilitate purchases that you couldn’t simply make on your own. You’re simply adding a huge additional cost to that high end item, one that alters the best case and worst case scenarios for each purchase significantly. The only debts worth incurring are for your education and possibly for your home. If you can afford the better item without negatively impacting other aspects of your life and you truly understand why the item is better (and, more importantly, why the item is better for you), then purchase the better item. I think all of this can be tied together with a note about my own experiences with piano playing. I practice a bit almost every day. I use an old electronic keyboard that sounds a little “off” to me – the reviews of it often chide the sound quality. However, the price – free – is something that I really can’t argue with. I’ve often looked at electronic pianos, and some of them are quite good. However, the good ones often have prices well into the thousands of dollars. I know why I would want such an item, and I know from experience and extensive research that such an item would be reliable and of a very high quality. I’ve even been to music shops and tried a few of them. I haven’t bought one, though. The best case scenario still involves me plopping down a few thousand dollars, and that makes the best case scenario simply not add up to enough to really compare to just playing on that free one in the basement. It’s good enough for me.